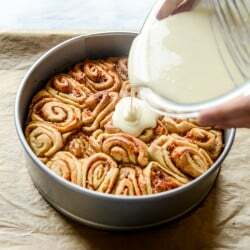 Carrot Cake Cinnamon Rolls with Mascarpone Icing. We all need breakfast dessert to be a thing. There is breakfast. And then there is breakfast dessert. You already know that if you just eat cinnamon rolls for breakfast, you will feel like garbage for the rest of the day. You’ll eat too many because you’re hungry. You’ll be sugar loaded and then crash hard and want to take a nice long carb nap. And wake up craving another cinnamon roll. BUT. If you eat some avocado toast with eggs first, you can totally have breakfast dessert. Carrot cake cinnamon rolls to the rescue. See? This always works out. Believe it or not, my distaste for veggies didn’t really begin with green things. It actually began with something as simple as carrots. I just couldn’t do the crunch or something – the texture was a huge no no for me. It might have been worse to serve me carrots with hummus instead of roasted broccoli, to be honest. And that’s totally weird, since carrots are SWEET! I mean, I didn’t even want roasted carrots. Not with cinnamon, not with butter, not with anything. I just wanted potatoes. Bah! I wasn’t very exposed to it as a child, and if I was, I probably immediately heard “carrot” and ran in the opposite direction. So I didn’t truly enjoy a piece until my early twenties, and even then I bet you can guess what I wasn’t in to. And the raisins. Those darn raisins. Is there a theme this week? Thankfully, most carrot cake I come across is raisinless. The world has listened! And the nuts are usually finely chopped, which thrills me as well. You can absolutely add those ingredients to the filling of these rolls and if you’re a fan, I’m sure it will heighten the flavor and texture even more. They will be a huge hit! Other things you can add, if you’re looking to trash up your carrot cake (rolls): some pineapple chunks and sweetened flaked coconut. I found the pineapple to be a little too wet for my dough, but if you dice up some fresh chunks it will work. And I have a few coconut-heavy recipes coming up here on the site, and with such a polarizing ingredient, I didn’t want to overdo it. But you can certainly overdo it and then it would almost be like a hummingbird cake! Whoa. Like a Joey Lawrence WHOA. I’m so hungry right now. Always being super crazy over cinnamon roll icing is ironic for me because when it comes to cake, frosting is my least favorite part. However, if I start frosting every single thing I own with mascarpone icing, I might eat myself out of house and home. It’s like a slightly lighter cream cheese frosting. Not as tangy. A bit sweeter. And it’s more of an icing than a glaze – it isn’t quite as runny so it doesn’t drip into all the cinnamon crevices. Which could be a sad thing, but it also means a thick lovely frosting hat on top of the cinnamon roll. There are carrots in this dough. There are carrots in the filling! This is officially a vegetable. So eat your vitamins and minerals. Heat the milk and water in a small saucepan until just warm. Place it in the bowl of your electric mixer and add the melted butter, the yeast and honey, stirring to combine. Let sit for 15 minutes until the yeast is foamy. Add in 2 1/2 cups of the flour, the egg, vanilla, salt, cinnamon and allspice, then turn your mixer onto low speed with paddle attachment. Stir in about 1/2 cup of the grated carrot. Once everything is combined, add in another 1/2 cup of flour and mix. Switch to the dough hook and knead the dough for 6 to 8 minutes, gradually adding in the remaining half cup of flour. Add the dough to a well oiled bowl (you can totally use bacon grease!!) and cover. Let rise in a warm place for 1 1/2 to 2 hours. Once the dough has risen, preheat the oven to 350 degrees F. Punch down the down and place it on a floured surface. Roll the dough out into a large rectangle, at least 12 inches long and 6 inches wide. Brush the dough with the melted butter. In a small bowl, combine the brown sugar, sugar, cinnamon, allspice, ginger, nutmeg and salt, then sprinkle it all over top of the dough. Add the finely grated carrot evenly over top. Starting at the bottom, tightly roll the dough up into one long roll. Use a sharp knife to cut the roll into 1-inch pieces. Place the rolls in a baking dish or pan and cover, allowing them to rise for 30 minutes. After 30 minutes, brush the rolls with melted butter. Bake for 25 to 30 minutes until golden and set on top. Immediately remove from the oven and pour the icing over top. Serve! Add the mascarpone to a large bowl and whisk until creamy. Whisk in the powdered sugar and vanilla extract, then stream in the milk and stir until a glaze forms. You will have to stir for a minute or two to remove any lumps and bring the glaze together. If the mixture still seems too thick, add more milk 1 tablespoon at a time, whisking well until smooth. Pour over hot cinnamon rolls. If I’m going to make these (or your original cookbook cinnamon rolls!) on Christmas Eve to bake on Christmas morning, at what point can I pause the process and refrigerate the dough? Would you make any baking adjustments? Thanks for all of the inspiration! My husband is craving these this weekend! Any chance you’ve ever tried prepping the night before and letting them rest in the fridge after rolling and cutting and then baking the next morning?